Snapchat’s staying power has been called into question this year, after a negative comment about the platform by Rihanna caused stock prices to drop and Q2 reports showed the company experienced a decline in users for the first time since it went public last year. But the app’s foray into ecommerce has proved to be very successful, as shown by its most recent campaign with Adidas. The two companies collaborated on the new Snapchat show “Fashion 5 Ways,” which was used to market a pre-release of Adidas’ new Falcon W shoe on Aug. 21. While watching the show, users were able to swipe up and buy the shoe directly in the app, with ecommerce company Shopify powering the shopping experience. Adweek reported that though Adidas did not share its exact sale numbers, “the company had a 100 percent sell-through rate (meaning all inventory allotted to the launch sold), and it sold out in six hours.” It is the first time a product was marketed for sale during a Snapchat show. When it comes to social commerce, a targeted campaign on one platform can often be more effective than advertising on multiple social channels. Reach your audience where they actually are, and more sales will follow. It’s easy to rely on previous wins to inform your strategy, but that doesn’t mean you shouldn’t try new tactics that can also bring sales. Earlier this year, Snapchat partnered with another popular shoe company to sell Air Jordan III Tinker sneakers exclusively through a QR code in the app. Released in the Staples Center in Los Angeles during the NBA All-Star Game, users could view a 3-D AR lens of Michael Jordan changing into a uniform with the sneakers, and the QR code was released after. The sneakers sold out in 23 minutes. It would have been simple for Snapchat to create a similar lens as the one that was used to sell the Air Jordans, which had already proven successful. 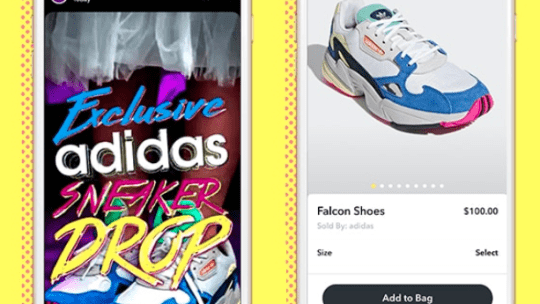 But instead the app decided to make use of its Snapchat Shows platform to market the Adidas shoes instead, in a move that called attention to Shows and provided a captive purchasing audience for Adidas. Always try new things when you can. You may find a new way to reach audiences and you’ll keep your content fresh.